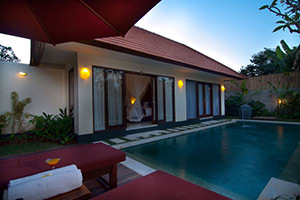 Luxury Villa, modern concept combine with Balinese style, privacy and comfortable. Each of villa with their own pool, fashionable, Balinese entrance gate, living area pavilion, Dining area, kitchenette and garden shower. Located at Jl. Batu Belig No. 168 Kerobokan, Seminyak, Kuta, Bali – Indonesia , just 20 minutes driving a car from Bali’s Ngurah Rai International Airport, 5 minutes walking distance to Batu Belig Beach, Metis and Sardine Restaurant. 2 minutes drive to: Potatoes head , Ku De Ta, Laluciola Rest, Seminyak square, eat street. Grab our special rate of today ! !